Though my emphasis was in high school choral music, I also student taught in an elementary general music setting, teaching students in kindergarten through fifth grade in two elementary schools. Through this experience, I was also able to work with the elementary choir, consisting of fourth and fifth grade students. Even though my student teaching course only required me to write a unit plan for my emphasis, I also chose to create a three lesson unit for the elementary students. I taught this lesson to all students in kindergarten through second grade, making adaptations as necessary. I chose to create a unit on Beethoven, focusing on facts about his life and his fifth symphony. Though the main part of my lessons involved Beethoven's Fifth, I also used several movement "mirroring" activities from John Feierabend's "Move It!" series that incorporated some of Beethoven's piano music. Below is a sample of one of my lessons from that unit; this one in particular was the third of my three lessons, and this version was taught to my second grade classes. It was a wonderful learning experience for me to have the opportunity to plan my own elementary lessons! "Miss Geesey was not only a great conductor and teacher but also the most personable and friendly student teacher I've ever had." "My favorite music teacher I've had in music because she felt comfortable making jokes with us but also got work done at the same time. Teachers who are too serious aren't what make music enjoyable." 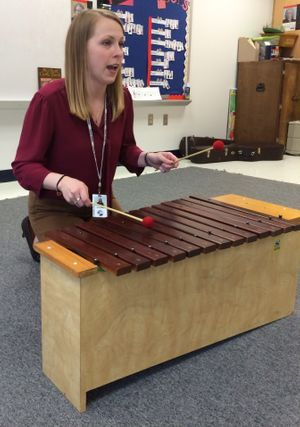 "Miss Geesey had a way of connecting with us as students that allowed us to make the music more meaningful. She was a delight to sing for!" Teacher will review song with students and have them sing it two times in a row. Teacher will split the class into two groups and have the class sing as a round; teacher will help groups with entrances as necessary. Students are permitted to use their books for this exercise. Teacher will teach students the second verse, having them echo short phrases after her. Teacher will have students echo longer phrases after her. Teacher will sing through the entire second verse once with the students. Teacher will provide an accompaniment at the piano and have students sing through verses one and two. Teacher reads rhythms with eighth/quarter rests and students will echo. Students decode rhythms with eighth/quarter rests and speak them without help from the teacher. Students will mirror teacher’s movement to the music. His job, what kind of music he wrote, how many symphonies he wrote, what happened to him at the end of his life (deaf), what symphony we have been studying, what country he is from? New fact to introduce: how he cut the legs off his pianos and sat on the floor to feel the vibrations (as he was going deaf). Teacher splits students into 2 groups (“A” and “B”). Students ID the form of Twinkle (ABA)— teacher explains form is the “recipe” used in music by composers. Students create their own “form” for Twinkle (ie. AABA, ABBA, AABB, etc). Teacher will choose student volunteers to write their form on the front whiteboard for the class to perform; students will have four spaces to fill and must use A and B at least once each. Students stay in their two groups (A and B). Teacher plays short excerpts of A’s theme (opening, in minor) and B’s theme (horns, in major) so they can ID them as they hear the full beginning of this movement. Teacher instructs students to mirror her movements when they hear their sections being played (teacher will keep steady beat on different parts of her body). If their part is being played, students must stand while mirroring the teacher’s movements; if their part isn’t being played, students must sit on the carpet and mirror the teacher’s movements. This helps to clearly show what section is being played by the orchestra. At end of 2:30 recording, students ID form of Beethoven’s 5th (ABAB). Students practice copying rhythm patterns as shown on board (including quarter and eighth rests); students flip/show board when they are finished so teacher can check/assess them. Teacher shows students Beethoven’s opening theme notation on the front board. Students create their own rhythm that ends in a half note like Beethoven. For guidance purposes, teacher shows what they can use on the front board. Students are permitted to use two “blocks” (which are equal to one beat) before the half note; each block can either be a quarter note, two eighth notes, a quarter rest, or an eighth rest plus an eighth note. Students flip/show board when they are finished. Teacher checks students’ rhythms as they finished and has them read their rhythm out loud; students may then put their whiteboards away, put their books away under their chairs, and line up.